As a writer about money and wealth, I've asked myself this question hundreds of times. My readers have also discussed this question in online forums. Having excellent health and immunity from disease. This is just a small sampling of what people have to say, but it gives you an idea about how varied and sometimes vague our thinking about wealth can be. And although I recognize the sense in many of these definitions, I find it impossible to talk to people about wealth unless I can get them to agree on some basic terms. So let's do that now. I suggest that we start with this definition: Wealth is a store of something valuable. I like that definition because it is simple and because, no matter what it is that you value, it emphasizes something essential about wealth: the idea of storage. Having the things that you desire - say, a big house and fancy cars-does not make you materially wealthy if you don't have the wherewithal to keep those goods over a protracted period of time. Nor are you wealthy in friendship if the many friends you have now would abandon you if your fortune changed. The point I'm making here may be too obvious to mention: Wealth is only sometimes about money. Understanding wealth in a broader sense, with implications that go beyond dollars and rupees, is essential. You want more freedom in your life. You want more choices about where you live, how you live, how much you work, and so on. You want more leisure in your life. You don't want to feel compelled to work eight or 10 hours every day for five or six days every week. You want more tranquility in your life. You would like an end to the stress that the lack of money sometimes causes. You want to be able to sleep easily at night and enjoy your days without worry. These goals are wrapped up very tightly in your desire for wealth - and as a result, they are a fundamental part of every step in our club program. Let's push a little further along this path and delve a little deeper into the way you think about your life and the things you value. I'm hoping that money is not the most important thing in your life. Nevertheless, material wealth does matter. It gives you the ability to help your friends, provide for your family, pursue intellectual and artistic interests, and become an inspirational role model for members of your community. Plus, if you don't have an income sufficient to meet your needs, you'll spend a good deal of time fretting about it-and when you spend time fretting about money, you can't enjoy the things you truly care about. This is a truth that more and more people are discovering late in their lives (including a few of my friends and family members). Stumbling into middle age with lifetimes of educational, social, and recreational experiences, people entering their 50s are waking up to depressing realization that they are working harder than ever to maintain a lifestyle that is not much better than the one they had when they were young. I've had the good fortune to be able to help dozens of such people work themselves out of this sort of pothole, regain solid ground, and go on to achieve financial independence. It took some time and it wasn't always easy, but it always began with a revelation - a revelation that was especially bracing for some of the smartest of them - that becoming financially independent is a good thing, something all good people should aspire to. Having enough money can liberate you from an unrewarding job, free you to follow your dreams, and allow you to take care of your loved ones. But never forget that the desire for money can also corrupt you. If, in pursuing wealth, you begin to believe that the accumulation of money is an end in itself - well, that's a bad thing. You are going to get good advice from now on. And if you follow my suggestions faithfully for a reasonable period of time, you'll someday - probably sooner than any of your friends or colleagues - discover that you are wealthy. But when that day comes, I'm hoping the greed virus will not have infected you. I hope you won't have become addicted to the idea of making the money pile grow. I hope you won't have forgotten what you know now - that there are many things more important than money. PS: I know that you are getting anxious for specific instructions you can start working on to build your wealth right away. Don't worry. They're coming. But this stuff is important. I want to be sure that you have done the right thinking. I want to be sure that you have accepted responsibility for your current financial situation. I want to be sure that you are committed to making a change. If you can do that, everything else will be easy. If you are nodding in agreement with me, then you are ready for my Wealth Building Blueprint. And Anisa promises me that you will have it soon... Just keep your eyes trained on your inbox for the blueprint. 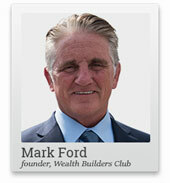 Mark Ford is a globally renowned author, entrepreneur, millionaire wealth coach. He founded the Wealth Builders Club which has helped hundreds of people around the world achieve a financial success most people only dream of. Equitymaster requests your view! Post a comment on "Being Rich Is Not Just About Having Money in the Bank". Click here! 2 Responses to "Being Rich Is Not Just About Having Money in the Bank"
I liked Mark Ford's article.I shall like to write to him .Please give his email address. Yeah, thats true, if you dont have the loads stacked up lifes many beautiful moment would go missing. Money comes with a lot of responsibility and being rich brings in lots of envy its your hard effort and determination which has created this pile. Since success has been yours it is time to share...... if all of us could pledge to share a small contribution of this pile irespective of our caste creed religion this earth of ours could be a wonderful place to live in. PersonalFN emphasizes on the importance of reviewing your mutual fund portfolio. Financial planning does not stop after retirement. Here is how retirees can build their mutual fund portfolio.